Find a job you love and you’ll never work a day in your life. That’s the mantra of the Grand Marshal for the 2014 Tucson Rodeo Parade, Dan Marries. That’s exactly how Dan feels about working as the evening news anchor at KOLD News 13 where he’s been keeping Tucsonans informed since 1999. Dan got his start in television news in 1995 while he was still a junior at Mesa State College in Grand Junction, Colorado. 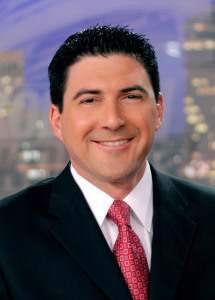 His internship lead to his first job in journalism as the morning anchor and noon weather man. Further news jobs took him to Mankato, MN, Yuma, AZ and finally Tucson. It was also during college he spent four summers as a wildland firefighter for the Bureau of Land Management. Dan is a self-proclaimed “wanna-be” cowboy and it’s apparent every year during the Tucson Rodeo Parade and Rodeo. That comes from his time in Pawnee, Oklahoma where he spent the latter years of his childhood and high school. Helping his uncle with cattle instilled in him the importance of putting in a hard day’s work. Dan’s grandmother had a heavy influence on his upbringing and she taught him the importance of community service. In high school, as the Master Councilor of the DeMolay chapter and as president of the student council, Dan would help the elderly with mowing their lawns, painting the trim on houses, serving breakfast and lunch at the neighborhood center, and carrying out their groceries as a bag boy at a family owned store. That spirit of giving back is just as important today as it was back then. Dan is the charter president of the Casas Adobes Optimist Club. For the past four years that club has adopted upwards of thirty less-fortunate families during Christmas, making sure the kids had presents under the tree and food on the table. Dan is also a founding trustee board member of the Greater Tucson Fire Foundation assisting our local fire community with funding, tools, technology, advanced training, equipment, survivor’s help, and education campaigns to support these brave men and women. He’s also the official “reader” of a book called “Born to Wear Blue” published by the Fire Foundation. Every year he volunteers during Love of Reading Week, spending time with children letting them know the importance of education. He’s also a frequent visitor to the Southern Arizona VA Medical Center, visiting with veterans to thank them for their service. For the past 8 years he’s served as the official announcer for the Tucson Veteran’s Day Parade and the Tucson Rodeo Parade telecast. His schedule is kept busy emceeing and attending hundreds of fundraisers for a variety of local charities including “BAG IT” that provides vital information for cancer patients, the Tucson Utility Contractors Association, United Way, Boys & Girls Club, the Marana School Foundation, and the Tucson Police Officers Foundation, to name just a few. Dan has been recognized with numerous awards as a journalist including two Emmys, one which came from a half hour documentary he shot, wrote, and produced on one of his three trips to Vietnam with local veterans. He won a Communicator’s Award for a rodeo story on legendary Ty Murray, and Ty’s efforts to give retired bucking horses a place to live. He’s also been recognized several times by the Arizona Associated Press. Dan’s community service, civic mindedness, and giving attitude make him a perfect choice for Grand Marshal of the 2014 Tucson Rodeo Parade.